This week’s spotlight sponsor is FanaticusXR. FanaticusXR is a start-up located in Tech Square with a focus on developing immersive, virtual reality experiences that everyone can enjoy. The start-up will use mixed digital realities and specialized hardware to create storyliving experiences that are themed after major franchises as well as original content. Problem: Virtual reality (VR) is a computer-generated environment that immerses users in a realistic simulation. VR is currently in its beginning stages, but the industry is quickly expanding. Most VR experiences are only semi-immersive. Fanaticus wants their VR simulator to become a social experience that will reach the greater population. While Fanaticus has this concept, they are relying on a team of Georgia Tech students, ‘Wizards of Woodruff place’, to create a broomstick flight simulator as a proof of concept. Projected Impact: Currently, most virtual reality simulators are designed for more than one player. This does not allow the user to freely explore virtual environments. In addition, most simulators use mechanical systems to move the user in a predetermined pattern. This project will build a single rider simulator where the simulator serves as the input for the movements in the virtual world. Thus, allowing for complete control and exploration of the virtual environment. This will increase user satisfaction and overall entertainment. Team ‘Wizards of Woodruff Place’ is excited to create a mechanical solution to improve the user experience in virtual reality. Proposed Solution: Team ‘Wizards of Woodruff Place’ is building a broomstick for users to ride while wearing a VR headset. The team is mainly focusing on the mechanical aspect of the broomstick flight simulator. 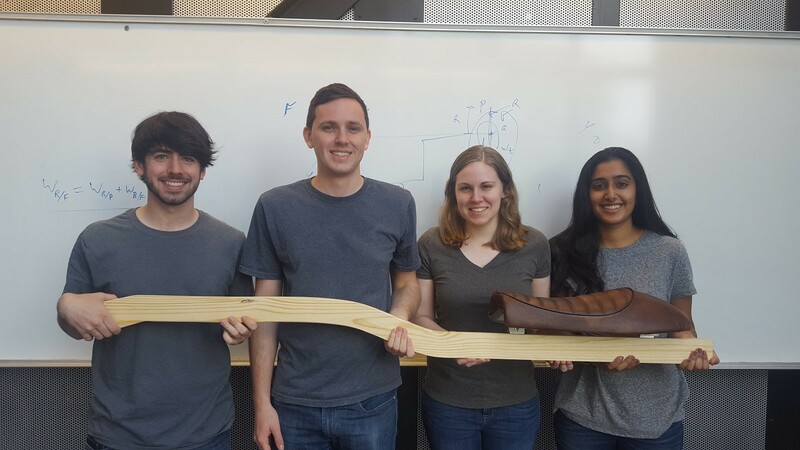 The team has started building the broomstick out of aluminum and wood, utilizing tools available in the Invention Studio. Unlike the in the movies, the team has attached a seat to the broomstick for users to sit comfortably. Even though their focus is mechanical, the team has had help from the Digital Integrative Liberal Arts Center (DILAC) lab to create a virtual environment to test their broomstick flight simulator. FanaticusXR’s founder, Ernesto Escobar says that the student team has been extremely resourceful. “Students on the team have leveraged their skills from non-ME minors to bring a creative perspective to the project. This capstone team is helping me get the startup off the ground. Thus, the impact is huge”.